> Does Car Colour Affect Your Auto Insurance Rate? When you bought your car, did the colour of it matter to you? Did you pick the colour for reasons other than you simply liked it? If you picked the colour of your car because you believed it would affect how much you pay for auto insurance, you are not alone. It's a very popular auto insurance myth. Perhaps that's why we tend to shy away from colour when buying a car. In North America, three in four cars are a either white, black, grey, or silver. Only one in four vehicles stray from this colour palette and is red, blue, brown, or green. No wonder it's so difficult to find your car in a crowded parking lot! Car colour does not matter. It doesn't matter if your car is a blue, red, green, silver, white, or black, your insurance rate for that make and model of car will be the same. 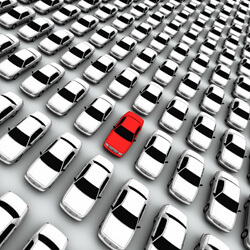 What "they" say about red cars costing more to insure, simply isn't true. What does affect the car insurance rate you pay? Depending on where you live, there may be other factors as well; however, these are the most common across most provinces in Canada. Don't believe that car colour doesn't matter? Compare auto insurance quotes online through Kanetix.ca. Not only will we help you find the lowest car insurance rate out there, but you'll see that in order to get accurate rates you are not asked once about the colour of your car. Are you ready to start saving today? On average, drivers save $346 by comparing quotes at Kanetix.ca and you could too.